Hen House: Has a clipless coupon to get Ragu Pasta Sauce for $1.29 a jar. Use a $0.75/2 coupon from the 9/11/11 Red Plum Coupon Insert and get 2 jars for $1.83 or $0.92 each. You can find all of this week’s Hen House Matchups here. Walmart: Schick Razor 10 ct are $1.97 each. There is a printable coupon for $6/2 Schick Razors available which means you can buy 2 for free plus make $2.06! The $2.06 will not be in the form of cash back, but will be applied to other items you purchase. 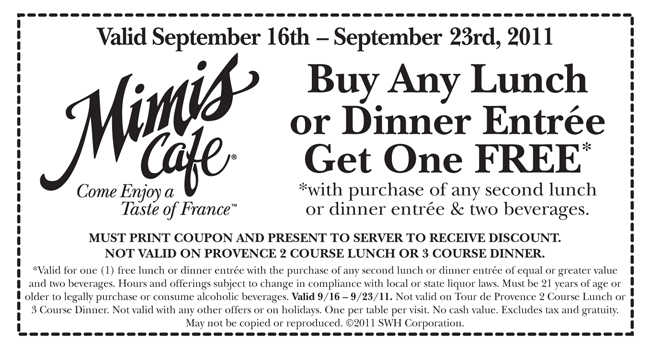 Mimi’s Cafe: Purchase any lunch or dinner entree and 2 beverages and get an entree free (coupon required). Old Navy: Head over to Facebook and print out a coupon good for 30% off of one item (in-store only) — plus throught this weekend, they are offering an in-store special B1G1 75% off. You should be able to combine the coupon with this sale and sae 30% off of the first item you purchase. Snapfish: Is offer 2 free 20 page 8.5×11 photobooks with the purchase of one. Just use the code LOVE8x11 at checkout (offer is good through today only – September 22nd).